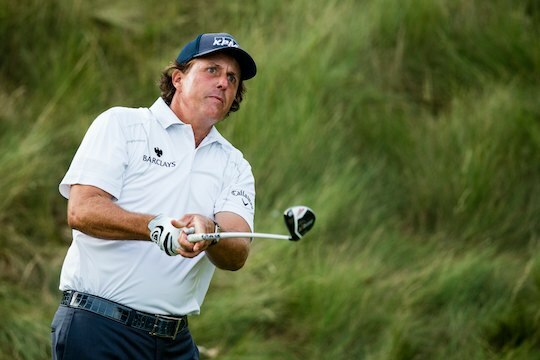 Phil Mickelson fired an even-par third round 70 for a one-shot lead over Hunter Mahan, Charl Schwartzel and Steve Stricker going into the last round of the US Open at Merion. Mickelson’s rounds of 67-72-70 has the five time runner-up in this championship at 1-under par, with Jason Day the best of the Australians in eighth place at 2-over. John Senden led the tournament for a brief moment early in the third round after opening with two birdies but reversed over the last eleven holes. Six dropped shots left Senden with a 74 and a five-over total in a tie for 11th. Tiger Woods, the No. 1 ranked player in the world and a four-time winner on the PGA Tour this season, has been out of sorts in this tournament seemingly suffering from a left elbow injury that he won’t discuss. Woods fired a third round 76 to drop eighteen places into a tie for 31st position heading into the final round. Rory McIlroy fared even worse, with four bogeys in his first six before a birdie at No. 7 put him at 5 over. The average score through two rounds on the par-70 course was 74.7. The cut line was 8-over, saving both defending champion Webb Simpson (5 over) and Scott (7 over) and keeping alive, albeit almost impossible, Scott’s hopes for a Grand Slam.